During the American Civil war, five men: Captain Cyrus Smith, an engineer; Gideon Spilett, a reporter; Pencroff, a sailor; Harbert, a student; Nab, a cook and Smith’s dog Top escape the siege of Richmond, Virginia by balloon. The balloon was launched during a great storm; the wind from the storm blows the balloon and its six passengers on a 6,000 mile journey. They manage to make it to an island, which they determine is in the South Pacific Ocean. Everyone is accounted for except their natural leader Smith and his dog. The engineer and his dog are found under mysterious circumstances, but it is just the first of the island’s many mysteries. Through the use of the engineer’s vast knowledge, their wits, courage and the occasional help of an unknown force, the men begin to turn this island into their new home. When they complete a small boat, they are able to journey to a nearby island and add another member to their island’s population. That man they eventually find out is named Ayrton, who was left on the nearby island for his involvement in the affair of the “Children of Captain Grant” (1868). The castaways survive an invasion by pirates, but their mysterious benefactor later reveals himself to them. Captain Nemo tells them his history and that they may not be able to survive the next attack. That next attack is from the island itself as the island’s volcano has begun to stir from its hibernation. NOTE: The stories “Les Enfants du Capitaine Grant” (1868), “Vingt Mille Lieues sous les mers” (1870) and this story are all part of a trilogy, with Ayrton and Captain Nemo being the linking characters. Unfortunately, for reasons yet unknown, but probably because this linkage wasn’t planned out in advance, the timelines for the three stories are inconsistent. This story takes place near the end of the American Civil War in 1865 and for the two years following; “Vingt Mille Lieues sous les mers” takes place in 1866 and “Les Enfants du Capitaine Grant” takes place in 1864. Don’t try to resolve these discrepancies because it is impossible. The Mysterious Island (Early Classics of Science Fiction). Translator: Sidney Kravitz. Introduction & Notes: William Butcher. Illustrator: Jules Ferat. Editor: Arthur Evans. Middletown, CT, Wesleyan University Press, 2002. 676 pages, 152 ill.
Translator: Jordan Stump. Introduction: Caleb Carr. Illustrator: Jules Ferat. New York, NY, Modern Library, 2001. 629 pages, 74 ill. The first full re-translations of this novel in over a century, both of these appeared back to back late in 2001, and both are now available in soft-cover editions. In actuality, for the last several years New Jersey engineer Sidney Kravitz had generously made his original draft available on an informal basis—spiral-bound, on diskette, and in Zvi Har’El’s Jules Verne Collection. For this official version, however, series overseer Arthur B. Evans has supplied the professional editorial touch, inserting contractions into the dialogue, tweaking the vocabulary, and lubricating the phrasing. As for Modern Library’s text, it’s a more recent effort by University of Nebraska professor Jordan Stump. Both reissues are reasonably priced. True, the Wesleyan costs four bucks more, but it packs plenty of extra value. Modern Library reprints 74 of the Férat illustrations, whereas Wesleyan offers all 152 in cleaner, clearer reproductions. What’s more, the latter features a huge scholarly apparatus: William Butcher supplies extensive annotations, analyses of the pertinent manuscripts, comprehensive bibliographies on the author and on this novel in particular, and coverage of Verne’s other desert-island efforts including his false start for this novel, Uncle Robinson. As for Butcher’s introduction, it’s endlessly stimulating, relating the novel’s tortuous evolution, detailing the struggles between the author and his micromanaging editor P.-J. Hetzel, and raising major questions for future researchers—for instance, I was startled to learn that Verne had originally planned a god-out-of-the-machine different from the one in the text we know. Fascinating stuff! For its part, Modern Library redraws Verne’s map with English place names, but otherwise the incidentals are pedestrian: their Verne bio is hackwork, featuring careless research (Verne didn’t “witness” the 1848 revolution, nor did he leave a MS of The Barsac Mission), and also recycling the old discredited fiction of young Jules running off to sea. And this last taradiddle is trotted out yet again in historical novelist Caleb Carr’s intro, a would-be think piece on the novelty of Verne using a mystery-yarn format. It’s a valid angle, but unfortunately for mystery buffs and first-time readers, Carr undercuts it by giving the plot away. So Wesleyan’s entry ought to be the easy winner—except for one lamebrained editorial decision. Wespress undermines the overall preeminence of their version by omitting Verne’s detailed chapter headings (Kravitz did translate them, as shown by his draft text at http://jv.gilead.org.il/kravitz/), which means that for all its added attractions and special features, this Wesleyan edition is literally incomplete. Consequently, for first-timers who simply want a good reading copy of this novel, my recommendation would have to be Modern Library. Serious Vernians, needless to say, will want both. -- Review by Frederick Paul Walter, extracted from “Verne in the Shops,” originally published in Extraordinary Voyages, Vol. 9, No. 3 (Mar 2003). Translator: W.H.G. Kingston. Introduction: Isaac Asimov. Afterword: Bruce Sterling. New York, NY, Signet Classics, 2001. 528 pages, ?? ill.
First came the true story of Alexander Selkirk who was abandoned from 1704 to 1709 on the desert island of Juan Fernandez, some 450 miles off the coast of Valparaiso, Chile. Daniel Defoe heard his story and in 1719 he published the famous Robinson Crusoe. It became an instant success and started the robinsonade genre of fiction. In 1813 Johann Wyss published Swiss Family Robinson and in 1841 Captain Frederick Marryat produced Masterman Ready also involving a family and the most accurate of the robinsonade since Marryat was a professional seaman before becoming a writer. I believe that Verne read Masterman Ready because his Uncle Robinson is so close in characters and opening plot. Verne’s publisher Hetzel, refused to publish Uncle Robinson and it was only released to the public in 1992. Verne later rewrote Uncle Robinson and it became Part I of The Mysterious Island with the characters changed from a family to five escaped Civil War prisoners. I’ve read the Kingston translation of The Mysterious Island at least ten times and I consider it a good translation. To those who are familiar only with that version here is a hodge podge of what I consider to be some of its deficiencies. Second, on almost every page Kingston felt free to omit words, phrases, sentences and even paragraphs from Verne’s text for no apparent reason. Fortunately, these omissions do not alter the plot or the development of the mystery. The worst example of this occurs early in Chapter X of Part II, where there is a large paragraph dealing with the details of the construction of the vessel, the Bonadventure. “The keel of the boat would measure thirty five feet and the beam nine feet — which would make it a fast sailer provided its bottom and underwater lines were well made — and it would not draw more than six feet, a level of water sufficient to maintain it against the drift. It would be decked along its entire length, pierced by two hatchways which would give access to two cabins separated by a partition, and rigged as a sloop with a spanker, a staysail, a foresail, a forestaysail, and a jib. These are very manageable sails conducting themselves well against squalls and holding on firmly when close-hauled. Finally, its hull would be carvel-built, that is to say that the planking would be flush instead of overlapped. As to its ribs, they would heat press them into place after adjusting the planking, which would be mounted on dummy frames. Why should Kingston omit so much material from his translation? My first conjectures were that Kingston had no knowledge of sailing and had wisely decided to avoid translating what would result in embarrassing errors or he thought that it would take him too much time to translate correctly and it wasn’t worth what he was getting paid. Third, in his very first editions, Kingston called the engineer Cyrus Smith just as Verne had named him and his translation of the title of the first part was “Wrecked in the Air. ” However in subsequent editions he called the engineer Cyrus Harding and his title for the first part became “Dropped from the Clouds. ” The name Harding is Kingston’s invention. “Dropped from the Clouds ” is a phrase from the first part of Shakespeare’s “Henry IV,” Act IV, Scene I, Line 108. The editor of Extraordinary Voyages, at the time, Andrew Nash writes: the following info was provided by James D. Keeline in response to part of Sid’s above message which appeared in an Internet discussion: “W.H.G. (William Henry Giles) Kingston (1814-1880) was a well-known author of stories for boys mostly published in England but many were known in the U.S. as well. 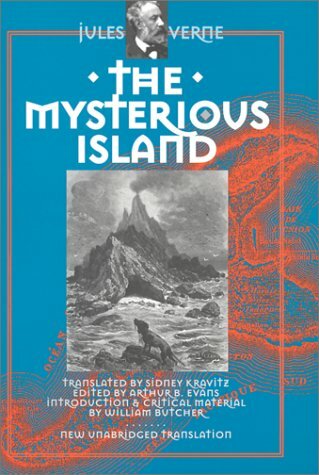 Below are some sources where biographical information on him may be found which may shed additional light on the contradiction Sidney Kravitz has presented over his translation of The Mysterious Island. — Allibone, S. Austin. A Critical Dictionary Of English Literature And British And American Authors Living And Deceased From The Earliest Accounts To The Latter Half Of The Nineteenth Century. (Lippincott, 1858-71; Gale Research 1965). — Doyle, Brian. Who’s Who Of Children’s Literature (Schocken Books, 1968). — Kirk, John Foster A Supplement To Allibone’s Critical Dictionary Of English Literature And British And American Authors (Lippincott, 1891; Gale Research, 1965). — Kunitz, Stanley J. British Authors Of The Nineteenth Century. (H.W. Wilson, 1936). — Lofts, W.O.G. ; Adley, D.J. The Men Behind Boys’ Fiction. (Lon: Howard Baker, 1970). — Patrick, David. Chambers’s Cyclopaedia Of English Literature: A History Critical And Biographical Of Authors In The English Tongue From The Earliest Times Till The Present Day With Specimens Of Their Writings. (Lippincott, 1938; Gale Research, 1978). 3 vols. -- Review by Sidney Kravitz, originally published in Extraordinary Voyages, Vol. 5, No. 1 (May 1999). Translator: W.H.G. Kingston. Illustrator: N.C. Wyeth. New York, NY, Antheum, 1988. 508 pages, 14 ill. The only reason to get this book would be for the N.C. Wyeth illustrations. Otherwise it the Kingston translation that you read about above.